David John Hobden Senior Constable of Echo District T.O.G. 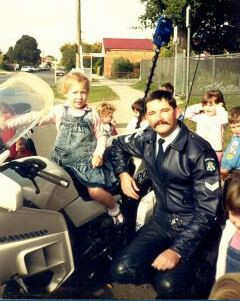 On 30 October 1990, Senior Constable David Hobden was travelling on his police motor bike with lights and siren operating in response to a call from D24 of ‘offenders on’ in a house at Endeavour Hills. At the intersection of Heatherton Road and James Cook Drive, Endeavour Hills he was involved in a collision with another vehicle. No fault was attributed to Senior Constable Hobden in regards to the collision. He was conveyed to Dandenong Hospital where he was diagnosed with a broken leg and two broken ribs. As a result of the injuries he was off duty for 12 months. Upon his return to Victoria Police David Hobden performed duty in a number of non-operational roles. During these years his injuries continued to trouble him and he underwent a further thirty operations. He also suffered arthritis in the spine. In 1996, David underwent a major operation which included rods and screws being inserted into his back and a bone graft. Eventually due to excessive pain and discomfort he was forced to retire from Victoria Police in 2005. David Hobden died in December 2011; the Coroner recorded the cause of death as unknown, however, medical evidence provided by two (2) physicians that treated Mr Hobden, indicates that they believe that the injuries he sustained in 1990 contributed to his untimely death. Senior Constable Hobden was awarded the Victoria Police Star in 2007 in recognition of the serious injuries he sustained.